Summary: Estimate building costs for a New Home in Northern California. How Much Does it Cost to Build a House in Berkeley California. Hello Carl, I’m wondering why it is so expensive to build in the East Bay Area. Your rough estimate is $137 per square foot, yet I see $300 - 400/sq ft on many blogs about actual cost of building here. Is it just the cost of land, or are there other sources of this incredible “mark-up”? I’m looking to build on a level lot in the East Bay, concrete slab foundation, no hillside heroics. Should I really count on $300 per sq ft? First of all, the cost of land has nothing to do with the cost to build. Building costs are comprised of labor and materials, and permits and fees related to the actual construction of the house. There are basically 4 parts to new home construction costs: labor, materials, land, government fees. If the house is being built for sale, the seller, whomever that should be, adds a profit to the selling price. The land (building site) and any land development costs are separate costs of the overall building project. Any impact fees, and other government fees, run with the development of a building site. It does cost more to build in this area, as well as any coastal area, and that is due to more expensive government fees, impact fees, and contractor and subcontractor labor. Contractors and subcontractors charge more because it costs more for them to live in these areas. But it should not cost $300-$400 per sq ft for an owner/builder to build an average house, or even an above average house. It shouldn’t cost that much using a local home builder or general contractor either. Maybe the blogs you were reading did have the land cost figured in. Maybe they actually paid a General Contractor that much. Who knows? Here’s a modern stucco design house from Houseplansandmore.com. • The perimeter of the building has 10 or more corners. • The living area is 2,398 square feet. • The number of stories is 1. 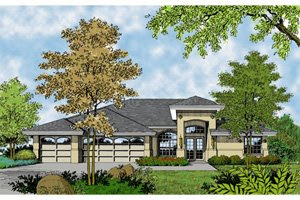 • Garage: 900 square feet of attached garage under the main building roof, same finish as the home interior. • Concrete deck, walk or driveway: 256 square feet of surface. • Central ducted heating and cooling. • 1 each insulated prefab metal fireplace, brick face. Using the Cost to Build Calculator found on my Getting Started page, and using 10 corners, Quality Class 6 (slab foundation) and Quality Class 4 for the rest of the house, the approximate cost to build this 2398 sq. ft. house from Houseplansandmore.com in East Bay (Metro area of Berkeley, CA, 94701) is approximately $370,775, including a General Contractor markup of $42,329. This works out to be $155 per sq. ft. based on the total cost of $370,775. Subtracting the General Contractor’s markup of $42,329 = $328,446, or $137 per sq. ft.